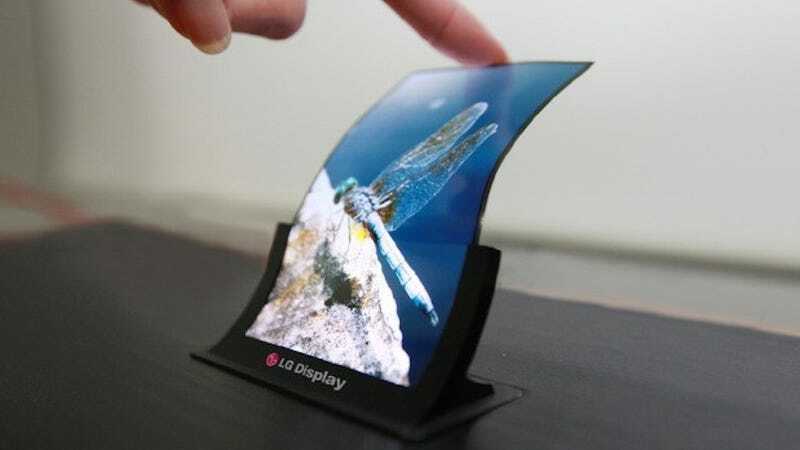 LG unveiled the "world's first flexible OLED panel for smartphones" on Monday morning and bragged about how products with "enhanced performance and differentiated designs" would follow next year. A fully flexible smartphone is probably not going to be among those exciting new things, however. Flexible displays are new and exciting, and there's no reason to trash talk them. But the arrival of flexible displays does not equal the arrival of flexible devices. In fact, there are still some pretty legitimate hurdles to clear before such a thing would be possible. The guts of a smartphone aren't exactly designed to be twisted, bent or rolled up, as some might like. The battery, in particular, is not an easy part to make flexible. CNET's Jessica Delcourt listed a few reasons why flexible phones were a long ways off earlier this year and also highlighted other challenges of flexible electronics like the extent to which they should be flexible and the inevitably prohibitive price. That's just inevitable for now, though. They'll get cheaper. None of this means that LG's breakthrough isn't impressive or important. The appeal of a flexible display for the time being is to build curved phones which most people expect LG to showcase in a few months if Samsung doesn't beat them to the punch. The new display does look pretty awesome in the meantime. It's built on plastic substrates instead of glass which makes the flexibility issue a little less of an issue and is so thin—0.44 millimeters thin—that it rivals even the non-bendable displays currently on the market. LG also brags that it's the lightest display in the world, weighing in at a mere 7.2 grams for a six-inch display. And since it bends, it won't shatter and break as easily as a glass display, though it might be prone to scratches.